No matter how unimpressive your skating skills, a trip to the 1,600-square-metre rink at Eco Park is guaranteed to be a ton of fun. Swirliskate at Eco Park in Rajarhat caters to every type of skater, from amateurs to serious students. Regardless of whether you want to literally chill out with your friends on ice, or actually learn the craft like a pro figure skater, Swirliskate has something for everyone. From one-off ice skating sessions to serious training and private events/parties to group bookings, Swirliskate’s 1,600 square feet synthetic ice rink is a complete winter wonderland. The ice rink can accommodate up to 40-45 skaters at one time. And, there is a viewing room for quiet onlookers, as well as a cafe lounge to take care of food cravings. If you’re afraid of falling down, don’t you worry – there are penguin aids in place for newbies. Get those gloves, scarves and socks out – winter is here all-year from now on. Transform yourself into the next Michelle Kwan at Swirliskate. A 30-minute slot on weekdays costs INR 170 and a 45-minute slot costs INR 200. On weekends, a 30-minute slot costs INR 200 and a 45-minute slot costs INR 230. 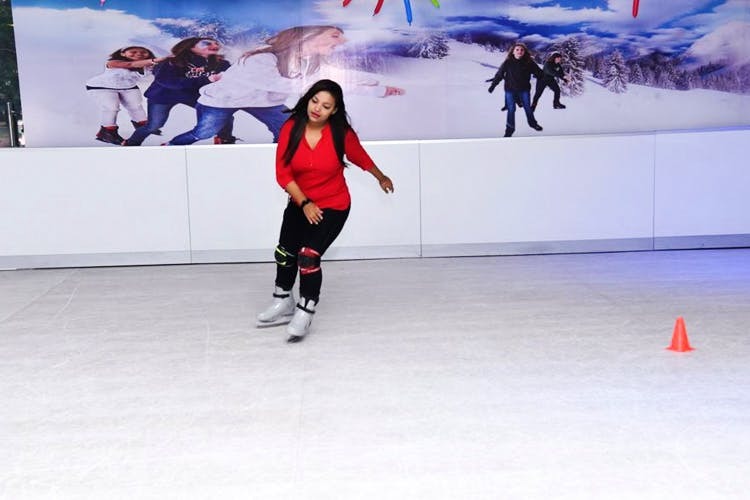 If you are interested in learning ice skating from a pro coach, monthly membership is priced between INR 1,200 to INR 1,700 for eight hours of coaching. All of these prices include ice skate rentals and safety gear. Bascially, all you need to do is show up, ready to have the time of your life on ice.